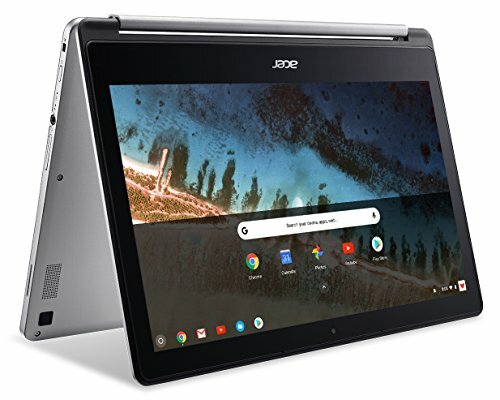 The Acer R13 and the ASUS Flip C302 exemplify the direction Chrome OS and Chromebooks, in general, are heading. Both machines have much greater aspirations than being glorified web browsers, causing us to pause and think about who should buy a Chromebook. When they first appeared on the market, Chromebooks were advertised as simple computers for people who don’t really need a computer with a traditional operating system. The idea was to get rid of everything except the web browser and fully embrace the power of the Internet and the cloud. The idea worked, but it had a limited appeal. Thanks to hundreds of thousands of excellent apps that can be downloaded with a click of a button from Play Store, smartphones and tablets have become everything Chromebooks could ever dream of becoming. It was time for Chromebooks to evolve and enter the territory of sub-$500 Windows laptops. The Acer R13 and the Asus C302 are built with Android support in mind and come with Play Store pre-installed, giving you access to all your favorite mobile apps and games, together with access to Chrome Apps. The R13 and the C302 also come with higher price tags that introduce new expectations and the question whether it doesn’t make more sense to purchase a Windows laptop, instead. From afar, both the Acer R13 and the ASUS Flip C302 look like MacBooks. It’s the combination of solid aluminum with an island-style keyboard that reminds us so much of Apple’s expensive laptops. The R13 weighs 3.2 pounds and measures 13.54 x 9.07 x 0.71 inches. The C302 weighs 2.65 pounds and measures 11.97 x 8.28 x 0.54 inches. Clearly, the more expensive C302 is also the more portable of the two, which is to be expected considering that its display is 0.8 inches smaller than R13’s 13.3-inch display. 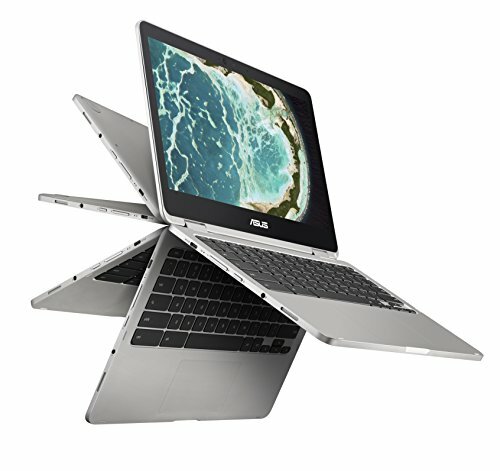 Both laptops come with a 360-degree reversible hinge that rotates to laptop, display, tent, and tablet positions. The C302 uses a hidden magnet to secure the display to the base of the laptop when in the tablet mode. Because of its smaller size, the C302 feels more natural and comfortable when used as a tablet, but the R13 offers more space to rest your hands on when typing. The Acer R13 has a spacious, responsive keyboard with only one major flaw: it’s not backlit. LED backlighting has become a standard feature of mid-range laptops, and we feel that a machine so sleek as the R13 really deserves it. The trackpad is smooth, and it never failed to register our input, including multi-finger gestures. On the left side are a full-size USB 3.0 port, a USB Type-C port without Thunderbolt 3 support, an HDMI port, and a MicroSD card slot. On the right side are a headphone jack, a power button, and a volume rocker. The ASUS Flip C302 comes with a comfortable, chiclet keyboard with 1.4 mm of key travel. Compared to the R13, the keyboard on the C302 feels slightly more precise, but the difference is only marginal. The keyboard’s real advantage is the presence of LED backlighting for night-time typing comfort. The buttonless touchpad is on par with the touchpad on the R13. As far as the port selection goes, ASUS included two USB Type-C ports, a MicroSD card reader, and a headphone jack. Both USB ports support display output and power delivery, making them far more useful than traditional USB ports. Winner: The ASUS Flip C302. We understand that some people are going to resist USB Type-C ports for as long as they possibly can. But considering that most high-end and flagship smartphones already come with nothing but USB Type-C, we think it’s safe to say that the era of USB Type-C is here. As such, we can’t fault ASUS for not including a standard USB port. However, we can fault Acer for not including keyboard backlighting, which is why ASUS is the winner of this round. The Acer R13 comes with an adequately bright 13.3-inch display with the Full HD resolution and decent color reproduction. Thanks to IPS technology, the display has great viewing angles, which comes in handy especially when using the laptop in the tent mode to present data to coworkers. The only thing we don’t like about the display is the glossy finish. Not only does the finish make the display harder to read, but it also leads to a sooner onset of eye strain. Above the display is a decent webcam with good audio quality. The 360-degree hinge lets you flip the display around and use the laptop as a tablet. The hinge is sturdy and feels that it’s going to last a long time. The ASUS Flip C302 has a 12.5-inch Full HD eDP (Embedded DisplayPort) display capable of simulating 2,400 x 1,350 pixels. Unless you have a superhuman vision, we don’t see the point of going beyond the maximum native resolution, which is 1920 x 1080 pixels. Even at this resolution, text is barely readable and applications are barely usable without software scaling to 125 or 150 percent. In terms of image quality, the display is sharp, vivid, and delightful to look at. Just like the R13, the C302 has an embedded HD webcam and a 360-degree hinge. Even though the hinge is more than strong enough to support the weight of the display, ASUS has also included a hidden magnet that firmly clamps the display to the base of the laptop when used in the tent mode. It’s a nice little feature that adds an extra sense of security, even though it might not be needed. Winner: The ASUS Flip C302 wins with its crisp 12.5-inch display with great color reproduction and wide viewing angles. The Acer R13 doesn’t have a bad display, especially considering the price of the laptop, but it leaves something to be desired in terms of color reproduction. We were initially worried when we found out that the Acer R13 comes with the quad-core MediaTek M8173C processor and the PowerVR GX6250 GPU. MediaTek processors tend to fall flat in performance benchmarks, and users often report worse Wi-Fi performance compared to processors from Qualcomm or Intel. To our surprise, the R13 could keep up with our web browsing needs, handling as many as 10 to 15 open tabs, including multiple video streams, at the same time. It was only when we went beyond 20 tabs when the entire laptop came to a crawl. We suspect, however, that it simply used up the 4 GB of available memory and had to resort to writing data onto the 64 GB eMMC flash memory module, which isn’t as fast as modern SSDs. At the bottom of the R13 is a pair of bottom-facing speakers, which are just loud enough to fill a quiet room with reasonably well-balanced sound. No complaints there. Just like the R13, the ASUS Flip C302 comes with 4 GB of RAM and 64 GB of storage. But unlike the R13, it has the Intel Core M3-6Y30 processor, which provides plenty of performance for multimedia consumption, web browsing, and light content creation. Best of all, the processor doesn’t require active cooling, nor does it ever get noticeably hot. We could run a web browser with multiple tabs open, listen to music using Google Play Music, and communicate with coworkers using Slack, all at the same time and without any lags or slowdowns. Of course, there’s only so much you can do with 4 GB of memory, but you may be surprised by just how much it is, especially when coming from Windows. The C302 has a pair of high-quality speakers that send sound through large resonant chambers, generating up to 87 decibels of crisp and powerful sound. While the small speakers can’t be compared to desktop speakers, their sound quality is adequate for casual multimedia consumption. Winner: The ASUS Flip C302. The ASUS performs better and sounds better. Both laptops have enough processing power to handle all regular tasks, but the ASUS Flip C302 gives you more headroom to enjoy everything Chrome OS has to offer. Acer states that the Acer R13 should last up to 12 hours on a charge. During our testing, the Chromebook consistently reached around 10 hours, without resorting to extreme power-saving measures. We estimate that most users should be able to comfortably go over 8 hours on a charge without even trying. Acer was able to achieve this using a large battery and the ARM processor architecture. You can find ARM chips inside most smartphones, tablets, and smart devices—and for a good reason. They offer excellent power consumption-to-performance ratio and are less expensive to manufacturer than their x86 counterparts. ARM chips also tend to stay fairly cool even under heavy loads, which is why the R13 doesn’t have any fans. The Chrome web browser, in particular, supports the ARM architecture really well. The ASUS Flip C302 is advertised to reach 10 hours on a battery charge, which translates to roughly 7–8 hours of web browsing with display brightness set to approximately 60 percent. That’s a decent battery life for 12.5-inch laptop available for less than $500. Winner: The Acer R13 has a longer battery life thanks to its larger battery and likely also the way Chrome OS handles the ARM processor architecture. While both laptops can go over 8 hours on a single charge, the Acer R13 can do it while set on a higher brightness level and with more battery capacity to spare. The Acer R13 sells for $399, although you shouldn’t have a problem finding it for slightly less than that. The ASUS Flip C302 is $100 more expensive, depending on how much eMMC storage you choose. The large price difference is, however, justified by the presence of a more powerful processor, a better display, and a slightly nicer build quality. At around $500, you start to venture into the territory of budget Windows laptops, which often include more attractive features and specifications than similarly priced Chromebooks, but they build quality leaves a lot to be desired. When you spend around $500 on a Chromebook, you leave with the feeling that you’ve purchased a premium laptop that does everything it was designed to do flawlessly. Winner: Tie. While the Acer R13 is $100 cheaper, it’s also slower and not as nice overall as the ASUS Flip C302. The ASUS Flip C302 is an amazing Chromebook that manages to fully justify its slightly premium price, and it’s also the winner of this comparison. While the Acer R13 is a great machine, it lacks the premium touch that makes the C302 so appealing. Thanks to the C302’s smaller size, it also makes more sense to use it as both as a tablet for multimedia consumption and as a laptop for light content creation while on the go. Great comparison, thank you David! This article is a great help. Just wanted to point out that in “but they build quality leaves a lot to be desired” I believe it should be their* build quality, yes? Either way, thanks again for the article! I’ve owned both the C302 and R13 at the same time and compared them closely in all facets of operation. I subsequently returned the C302 because although it has a backlit keyboard, it is not superior in any way to the R13, even though it is $100 more expensive. The R13 has better color (the C302 has rosy tones), the R13 has better speakers (louder and 4 speakers – two bottom and 2 side), the R13 has an HDMI port, and the R13ś larger display is just as bright and sharper when comparing Youtube videos side-by-side. 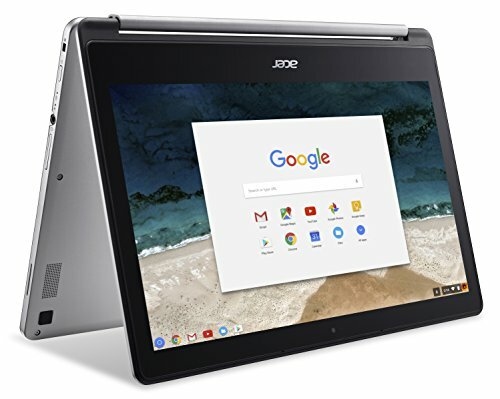 If you want a more expensive Chromebook with NO better features other than it has a backlit keyboard and is a little lighter, choose the C302. Otherwise, the R13 is much better.